Our Submission platform is a SaaS-based tool that creates high quality 510(k), De Novo and PMA submissions ready for FDA review and meeting FDA’s technical and style requirements. It utilizes a guided process reducing resource requirements, cost, and time, strengthening the content of your submission and streamlining workflows. And has a rich set of project management and collaboration tools to ensure your team works effectively. FDA and Standards databases means you select data not type it in - and reduce needless errors that delay 1/3 of submissions. Our software guides you through the creation of a CSR pursuant to the ICH E3 guidelines for Clinical Study Reports. It helps build high quality content and allows for easy integration and management of your clinical data analysis and Section 16 appendices. 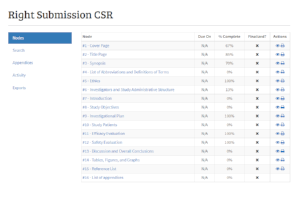 You can then seamlessly merge your completed CSR into the 510(k) platform for premarket clearance. MEDDEV 2.7/1 Rev 4 requires some products to update CERs annually. Right Submission's customizable CER software helps your team work smarter not harder to produce up to date and compliant CER reports. This free tool allows the experienced and novice user to assess and document their medical device FDA regulatory pathway decision making process and supports regulatory strategy development. Share and control your documents with revision control and visualization.